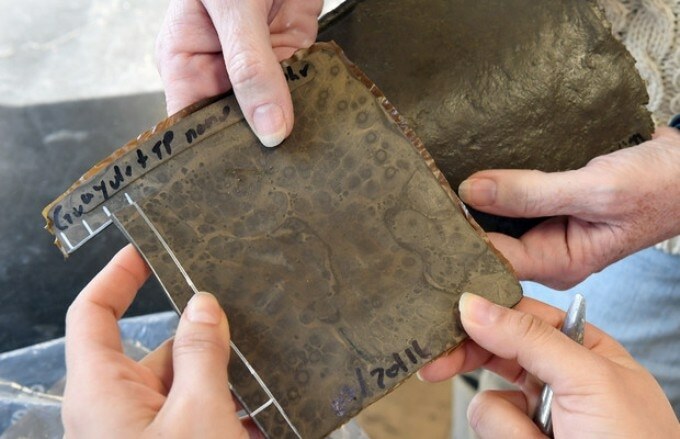 A team of researchers at The Ohio State University report that food waste can partially replace the petroleum-based filler that has been used to manufacture tires for over a century. It was shown in tests that rubber manufactured with the new fillers surpasses industrial standards for performance, which may eventually pave the way for new applications using rubber. As Katrina Cornish explains, the technology is a promising means of resolving three problems: It makes manufacturing rubber products more sustainable, keeps waste out of landfills, and minimizes American dependence on foreign oil. For years, Cornish, an Ohio Research Scholar and Endowed Chair in Biomaterials at Ohio State, has been involved in cultivating new domestic rubber sources, such as a rubber-producing dandelion. She now has a patent-pending technique for converting tomato peels and eggshells into viable - and locally sourced - substitutes for carbon black, a petroleum-based filler that American companies frequently import from overseas. Approximately 30% of a common automobile tire is carbon black; which is why the tires appear black. It makes the rubber long-lasting, and its cost differs according to petroleum prices. Carbon black is becoming harder to come by, Cornish said. The tire industry is growing very quickly, and we don’t just need more natural rubber, we need more filler, too. The number of tires being produced worldwide is going up all the time, so countries are using all the carbon black they can make. There’s no longer a surplus, so we can’t just buy some from Russia to make up the difference like we used to. At the same time, we need to have more sustainability. That is the reason that her team is collecting eggshells and other food waste from Ohio food manufacturers. According to the USDA, nearly 100 billion eggs are consumed by Americans every year. Half of the eggs are cracked open in commercial food factories. The factories then pay to have the shells removed to landfills by the ton. At the landfills, the mineral-packed shells do not break down. The tomato is said to be the second most popular vegetable in the United States. It also provides a source of filler, the researchers discovered. Americans consume 13 million tons of tomatoes annually, most of them canned or otherwise processed. Commercial tomatoes have been engineered to grow thick, fibrous skins so that they can withstand being packed and transported to various places. When food companies produce a product such as tomato sauce, they peel and throw away the skin, as the skin is not easily digestible. Cindy Barrera, a postdoctoral researcher in Cornish’s lab, discovered in tests that eggshells consist of porous microstructures that provide larger surface area for contact with the rubber, and give rubber-based materials remarkable properties. On the other hand, tomato peels are very stable at high temperatures and can also be used to produce material with good performance. “We may find that we can pursue many applications that were not possible before with natural rubber,” Cornish added. The new rubber has a reddish brown color instead of the usual black depending on the amount of tomato or eggshell in it. With doctoral student Tony Ren, Cornish and Barrera are currently testing various combinations and seeking ways to incorporate color to the materials. Current Ohio State doctoral student Jessica Slutzky and former master’s student Griffin Michael Bates took part in the research. The Ohio State University has licensed the patent-pending technology to Cornish’s company, EnergyEne, for additional development.